Do you often visit your grandma? Love to hear her stories of old days and watch her old photo album? Just think, here she’s 25 years, here she’s 16, and there she is merely a child! Each photo has a unique story behind it, with each photo some experience is connected. 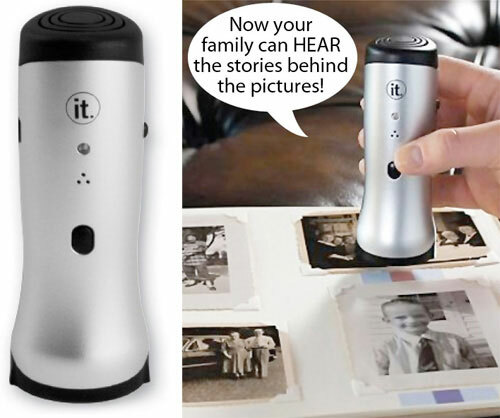 Unlike now, when any $50 phone has a built-in camera… To help you remember all these stories comes a new device called the Photo Album Story Teller. The gadget is very similar to most ordinary pepper-pot, but in fact is something of an intellectual voice recorder with camera. Hover it over interesting photography, and the device tells a story connected with this photo. Of course, the story should be recorded in advance. Unfortunately, nothing fantastic can be expected of this toy, it scans not the picture itself, but a color marker – a label that is applied to the picture beforehand. These labels come in 500 pieces bundled with the device. The power for the device is supplied by three AAA batteries, which should ne purchased separately. Photo Album Story Teller is worth (or is it?) $99.95. A little more than a week has passed since the IFA 2010 ended in Berlin, but it still echoes with interesting developments. 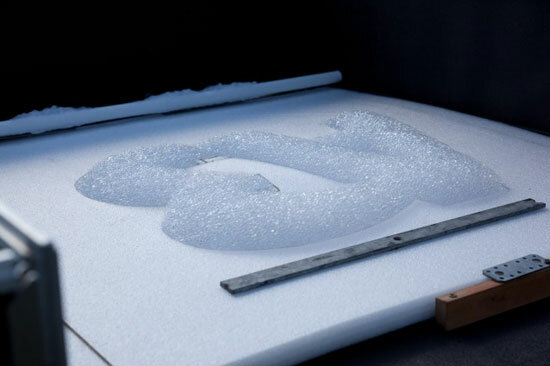 The whole world has long dreamed of an adequate version of a three-dimensional printer, which will create three-dimensional shapes at a reasonable price. Something remotely resembling this dream was presented at the IFA 2010, however, the figurines were created from the foam. On the working surface of the printer appear simple objects, letters and numbers, that are cut off with a blade resembling an ordinary rail. Objects “printed” like this leave the nest and soar upward. This system is, of course, will not fit for modeling prototypes in engineering. But in the filed of advertising, this printer is just the perfect tool: a company’s name or even logo flying in the sky will make the audience go wow. 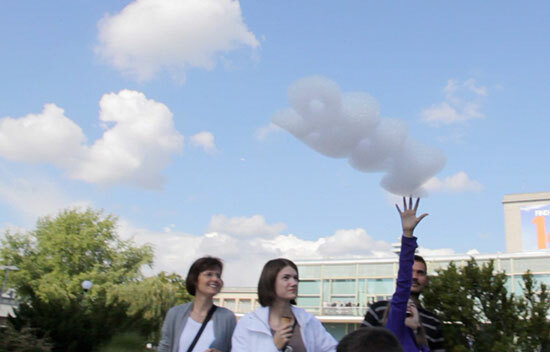 The only hope is that the foam is friendly to the environment, as nothing is reported on that. 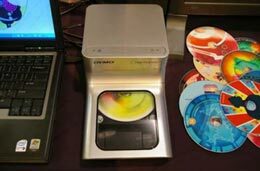 Pocket Printer–who has not dreamed about it? Take a picture of a person you like , immediately print it out and give it to him. 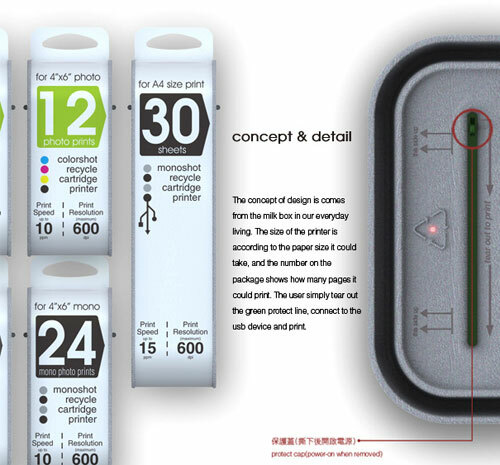 A concept of such device, the Instant Cartridge Printer, was offered by two Chinese designers, Yuexun Chen and Chia-Chen Hsiao. 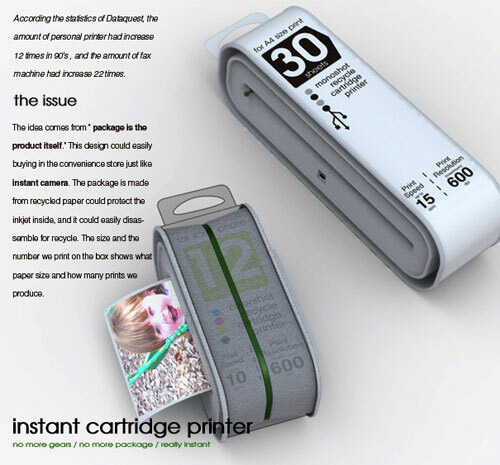 Instant Cartridge Printer is a small mobile printer with disposable cartridge. It is small, and easily fits in your pocket or bag. This device is supossed to print ten to fifteen 4×6-inch photographs per minute. So you can take it with you anywhere you go, connecting it via USB to a camera, amobile phone or a laptop. That is a spanshot you just just took can be printed directly on the spot. People with whom we are traveling or relaxing will especially like it. They would have to meet you again to collect the photos or keep begging you to send them the pictures by e-mail. Of course, there’s nothing to say about high quality of printing and color. 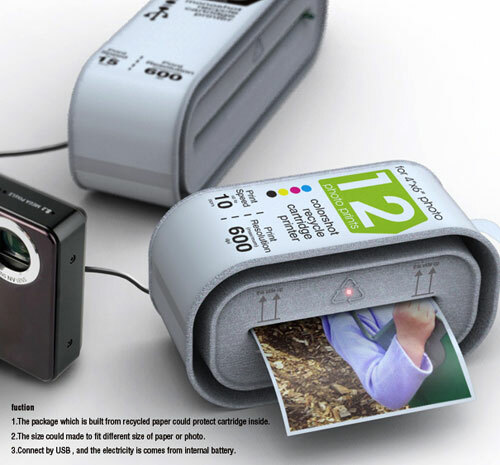 But this pocket printer is compact, mobile and cheap. Excellent offer for people who are not hunting top-level shooting and printing.